Who’s reinventing health benefits? One of the most hated companies in the U.S.
It’s hard to think of a company that seems less likely to transform health care. It isn’t headquartered in Silicon Valley, with all the venture-backed startups. It’s not among the corporate giants — Amazon, Berkshire Hathaway and JPMorgan Chase — that recently announced, with much fanfare, a plan to overhaul the medical-industrial complex for their employees. And it is among the most hated companies in the United States, according to many surveys on customer satisfaction. It’s Comcast. The nation’s largest cable company — the $169 billion Philadelphia-based behemoth that also controls Universal Parks & Resorts, “Sunday Night Football” and MSNBC — is among a handful of employers declaring progress in reaching a much-desired goal. In the last five years, the company says, its health-care costs have stayed nearly flat. They are increasing by about 1 percent a year, well under the 3 percent average of other large employers and below general inflation. Comcast, which spends roughly $1.3 billion a year on health care for its 225,000 employees and families, has steered away from some of the traditional methods other companies impose to contain medical expenses. It rejected the popular corporate tack of getting employees to shoulder more of the rising costs — high-deductible plans, a mechanism that is notorious for discouraging people to seek medical help. Most employers now require their workers to pay a deductible before their insurance kicks in, with individuals on the hook for $1,500, on average, in upfront payouts, according to the Kaiser Family Foundation. Instead, Comcast lowered its deductible to $250 for most of its workers. Cable-TV subscribers who have felt confused and overwhelmed when dealing with Comcast customer service may be surprised to learn how nimbly the company has upgraded services for its employees. While Comcast continues to work with insurers, it has largely shunned them as a source of innovation. Instead, it has assembled its own portfolio of companies that it contracts with, and invests in some of them through a venture-capital arm, Comcast Ventures. 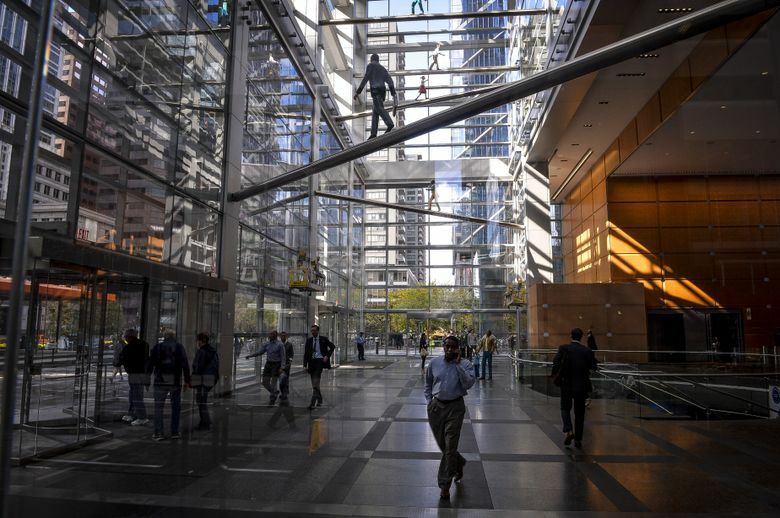 One such company is Seattle-based Accolade, in which Comcast is an investor, and which provides independent guides called navigators to help employees use their health benefits. Another, called Grand Rounds, offers second opinions and help in finding a doctor. Comcast was also among the first major employers to offer workers access to a doctor via cellphone through Doctor on Demand. “We see the startup community as where the real disruption is taking place,” said Brian Marcotte, chief executive of the National Business Group on Health, which represents large employers. “We weren’t seeing enough innovation.” The group now vets some of these companies for employers, including Comcast. Comcast “is the tip of the spear,” Marcotte said. The corporation, of course, is controlling costs and offering these unusual benefits out of self-interest. And these services are sometimes handed out at the expense of improving wages. In a tight labor market, Comcast also needs to remain competitive for not only highly skilled employees, but also lower-wage workers whose direct contact with customers has generated so much dissatisfaction over the years. “We do these things because it’s great for business,” Leavitt said. But much of what sets Comcast apart is its willingness to directly tackle its medical costs rather than relying on others — insurers, consultants or associations. It’s a luxury only the largest companies can afford, and roughly a fifth of big companies continue to see annual cost increases of more than 10 percent, according to Mercer, a benefits consultant. Other employers are focusing more attention on unsatisfying hospitals and doctors. Walmart has been at the forefront of efforts to direct employees to specific providers to get medical care, even if it means paying their travel to places like the Mayo Clinic. The majority of working-age Americans — some 155 million — get their health insurance through an employer, and most companies cover their own medical costs. The companies rely on insurers to handle the paperwork and to contract with hospitals and doctors. Insurers may also suggest programs like disease management or wellness to help companies control costs. At Comcast, some workers probably miss out on the new ventures altogether and others don’t have much choice but to go along. The company’s relationship with labor is often strained, and it has largely managed to fend off efforts by groups like the Communications Workers of America to organize its employees. Robert Speer, an official with a local of the International Brotherhood of Electrical Workers in New Jersey that represents about 180 workers, noted the company’s use of independent contractors to do much of its work, none of whom are eligible for benefits and can be paid by the job rather than hourly. “You are making no money,” he said. And, like many other workers, many employees are being pinched by the rising cost of premiums, Speer said. Comcast workers with company coverage are told to go to Accolade first. Its phone number appears on the back of their insurance cards and on the benefits website. “The key to Accolade’s success is being the one place to go,” said Tom Spann, a co-founder of the company. Geoff Girardin, 27, used Accolade when he worked at Comcast a few years ago and he and his wife were expecting. “Our introduction to Accolade was our introduction to our first kid,” Girardin said. He credits Accolade for telling him his wife was eligible for a free breast pump and helping find a pediatrician when the family moved. “It was a huge, huge help to have somebody who knew the ins and outs” of the system, he said. Insurers are usually none too pleased with the employers’ use of alternatives: They’re reluctant to share information with an outside company and poised to undercut a potential competitor by offering a cheaper price. They may even refuse to work with some of the companies. The largest employers push back. Fidelity Investments insists on cooperation between insurers and outsiders, said Jennifer Hanson, an executive at Fidelity Investments. “Those who don’t will be fired,” she said at a health-business conference. For Comcast, the next frontier is the financial well-being of its employees, many of whom live paycheck to paycheck and may not be able to afford even a small co-payment toward a doctor’s visit. Employees who run into financial trouble have no independent source of information, Spann said. After talking to hundreds of companies, Comcast Ventures could not find a financial-services startup that would help employees without trying to sell them a product or earning their money on commissions. So Comcast recruited Spann to serve as CEO of a new company, Brightside, that it created and invested in.